b. A fragmentary funerary relief, inv. 73.AA.115 [Getty]. Acquired from Nikolas Koutoulakis. Publ. Janet Burnett Grossman, Greek funerary sculpture: catalogue of the collections at the Getty Villa (Los Angeles, 2001) [Worldcat] [Google Books]. 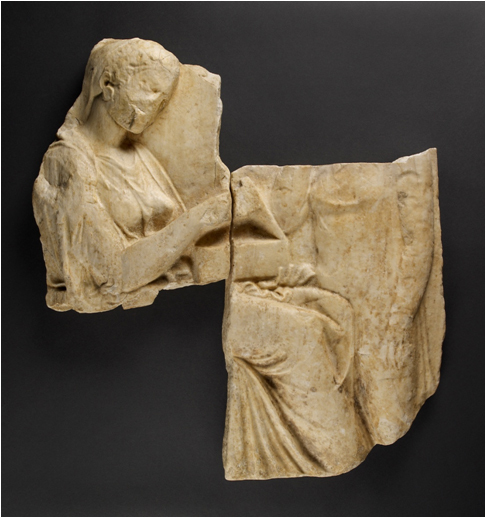 The two fragments in the Getty fit a third piece in the Kanellopoulos Museum in Athens (inv. 1168). A reconstruction appears in Greek Funerary Sculpture, p. 11, cat. no. 2. The link between the three fragments was apparently made by Jiri Frel, and reported by Mary-Anne Zagdoun, in a discussion of the Kanellopoulos collection (BCH 102, 1978, 291-292). The reunification of the funerary relief makes a great deal of sense. It would be interesting to learn the source of the Kanellopoulos fragment. 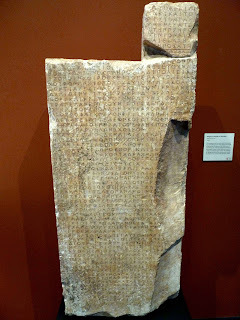 Where and when was the stele found? The Thorikos inscription is clearly important for the study of Attic religious calendars. But why has this object been selected for return? When did it leave Greece? What is its full collecting history? I am grateful to Julie Jaskol in the Getty's Media Relations for this information.